Thanks to an entirely revised chassis, Audi has been able to dramatically alter the layout in both the S5 and A5. The result is firmer handling with much improved weight distribution. The new layout permitted a redesign of the steering system, which now offers a level of feel and precision previously unknown to the brand. Audi 2009 s5: one of the best starter cars. I think that the Audi 2009 s5 is a really spectacular car, and I would recommend it for any first time drivers. It was technically my 2nd car, but I like to pretend that it was my first, and it is a really enjoyable experience. It is easy to figure out and maneuver, and it is really smooth when you first buy it. The newer versions might be a little better, but the 2009 version was the one I enjoyed driving with, and I hope that you give it a chance. It has great acceleration and cornering for a moderate priced car. It has a great sporty look. It handles great in all weather conditions. It has a powerful V8 engine. It has been reliable. 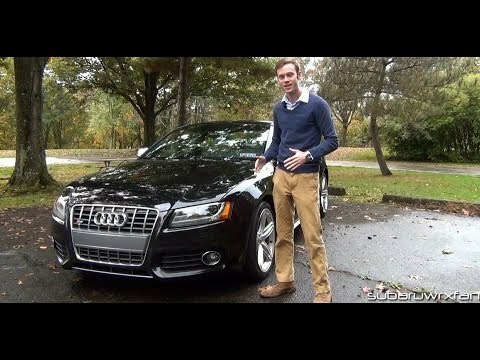 Audi S5 V8 Review. Best bargain GT car right now!